Wolverine #5.1 makes a great bookmark! 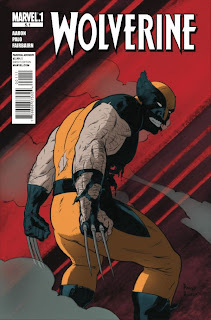 Based on the killer Wolverine #5.1 promotional bookmark, which marvel released about a month ago and I have been using in my Michael Cain autobiography The Elephant to Hollywood (recommended), I imagined that the Jefte Palo one-shot would thoroughly please me. Unfortunately, my expectations may have been set a little too high. Jefte Palo put together an eye opening mini series this past year when he worked with Fred Van Lente on Taskmaster. His version of Tasky had a playful edge to him which humanized his character. While the playful edge definitely carried over in the comic of the day through depictions of Marvel heroes at a surprise party for Wolverine, something was still lacking. If I had to take a stab at what it was I would say the noses. It seemed like the noses on ever face were very awkward. Their presence seemed unsure. It was as if someone stole the characters noses and when that person returned the noses, the thief returned thumbs instead. We can all understand how that can happen. Who's grandfather hasn't stolen their nose at one point in their life? Every panel that contained noses started bugging me and made me wonder what went wrong. The answer seems quite simple, actually. In the Taskmaster series, Palo did not draw many noses. Most of the characters wore masks that did not include noses, such as Taskmaster and the multiple goofy villains he fought. With a little more than just a mini series to practice on, I'm sure Palo will improve on the human horn and I can go right on anticipating his next projects.